The Mysterians (aka Chikyu Boeigun, 1957) is a great Japanese science fiction film produced by Toho Studios in 1957 and directed by Ishiro Honda, who's mostly remembered for his Godzilla movies. The story involves a group of aliens called the Mysterians who arrive on earth from the planet Mysteroid with their giant destructive robot and immediately demand three-square kilometers of land and some Earth women to breed with. Naturally they are refused and humanity declares war on the Mysterians. Starting on Monday 13th November on BBC Four is the BBC's tribute to the weird, wonderful and quirky world of British science fiction - the Science Fiction Britannia season. Details of the series are still not complete, but there's already some great highlights confirmed for the coming weeks. These include a classic Jon Pertwee Doctor Who story (Spearhead From Space) and Tom Baker's The Ark In Space, the excellent BBC version of The Day Of The Triffids (six episodes), Adam Adamant (plus a documentary on the show - The Cult Of...Adam Adamant) plus allsorts of specials about a diverse arrange of people and subjects, including Nigel Kneale, HG Wells, Iain Banks, Terry Pratchett, Doomwatch, Quatermass, robots, British sc-fi movies and the best of British TV sci-fi. Expect more to be added to the schedule in the coming weeks. And don't forget to set the recorder. Arguably the most famous silent movie of all time, Metropolis gets an outing at London's Barbican Hall in October with a twist - a live orchestra will be playing the original score. 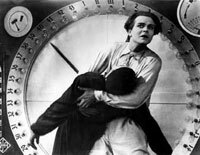 Fritz Lang's 1926 futuristic masterpiece was also the first ever sci-fi blockbuster - set in 2000 in the mechanised city of Metropolis, the rich enjoy life on the ground, while the oppressed workers toil below-deck to keep the upper classes in their life of luxury. This one-off presentation features the original score, performed live by the renowned German Film Orchestra Babelsberg. You can catch it on 2nd October as part of the Barbican's Silent Film series, with tickets starting at £8.50. You never know, it might wash away memories of that truly awful Queen-initiated 80s score.